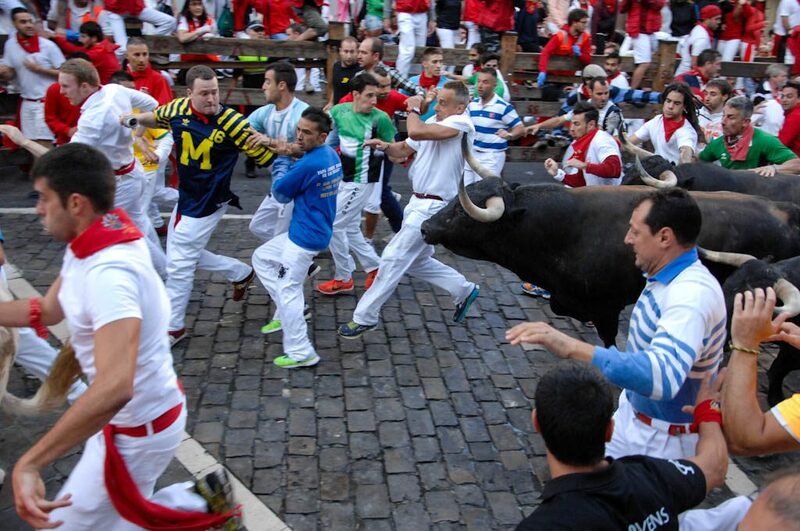 The Running of the bulls runs along several narrow streets of the old quarter of Pamplona, starting from the slope of Santo Domingo Street all the way up to the bullring. In total, it covers 875 meters. The run starts at the bottom of a sloping street called Santo Domingo. This first stretch, of some 280 metres (about 293 yards) goes up as far as the Town Hall. It has always been considered the most dangerous stretch because on this initial stage the bulls burst out of their pen full of energy and are on top of the runners in a trice. To be more exact, it´s the third part of this stretch which is the really dngerous part. There is no protective fence on this part which leads into the small square in front of the Town Hall and so, there is no place you can duck into out of the way of the rampaging bulls. It´s vital to be aware of this fact so that you can calculate the exact place and distance that you plan to run. 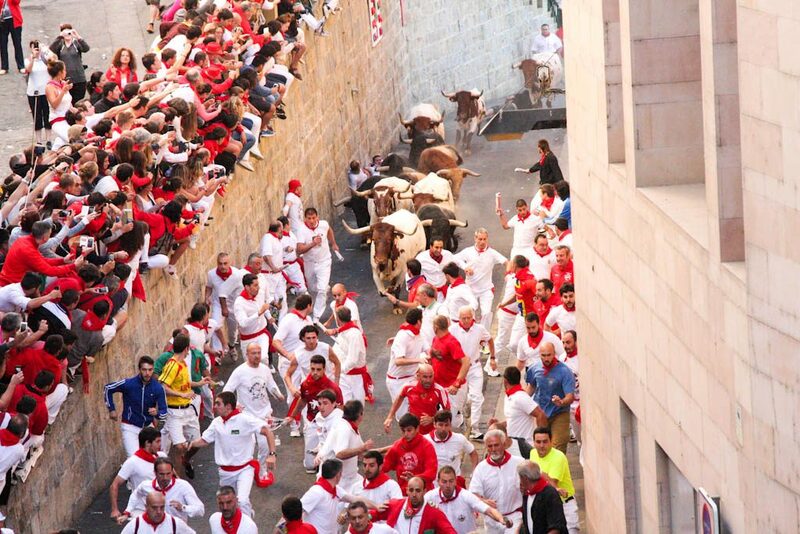 Just at the starting-line there is a small nitch built into the wall which holds a small figure of San Fermin. 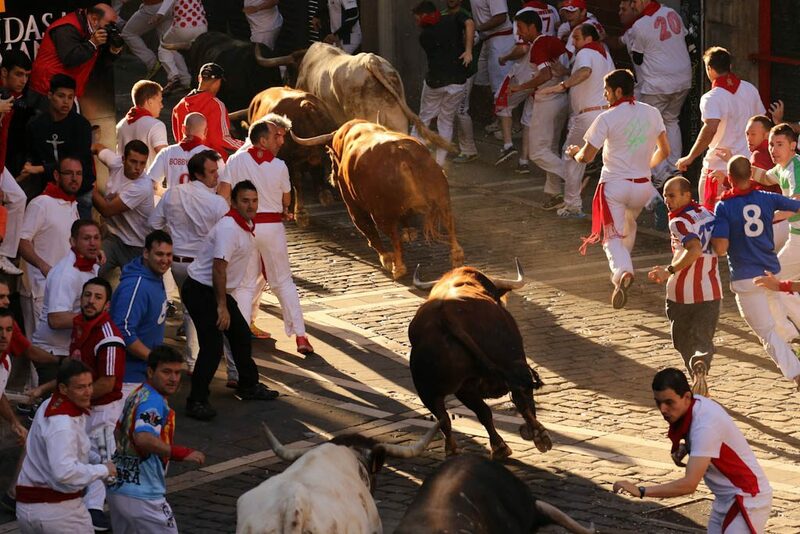 Here, the runners who are bunched up in a disordered pack, chant a homily to the saint to entreat his protection just before the bulls are let loose from the pen. The stretch widens as you move into the Ayuntamiento square and onto a short street called Mercaderes. This stretch is about 100 metres long (About a 110 yards). The bulls begin to slow down somewhat. 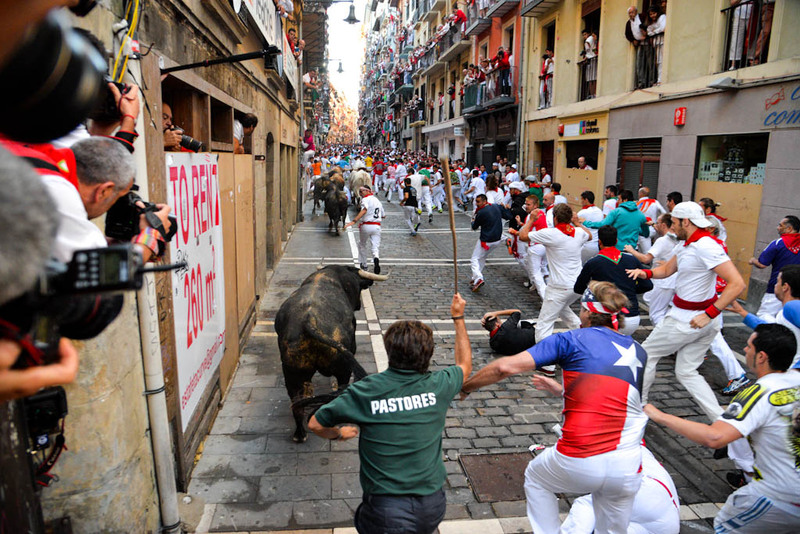 The run is on a bend so the bulls tend to pull towards the right side of the fence brushing against the sidewalk of the street. On this stretch you have a good chance of making a quick exit through the fence as it´s the longest section of fencing along the whole route. At the end of Mercaderes Street the route takes a sharp right turn into a street called Estafeta. Two important things have to be kept in mind at this point: it´s very dangerous to take the turn on the wide side, that´s to say, on the left side. The bulls, carried by their own inertia, tend to pull over towards the left and they slide up against the fence and the wall on the corner. They sometimes lose their footing and anyone caught between the wall and the bull could get flattened by them or even suffer some more serious misfortune. It is important that you make sure to take this turn on the right side. The danger tends to increase in Estafeta street as very often there is a loose bull that gets separated from the pack when it has slipped up at the corner of Mercaderes. It is almost impossible to run the whole length of Estafeta as the bulls will overtake you and you will need to find a moment to get out of their way. It is important to slip aside cleanly without tripping up or hindering other runners in any way. Equally, it is important to be careful if you want to try to get a position close in front of the bulls’ horns. Remember any shoving or tripping up other runners here could endanger their lives and have serious consequences for them. So, in Estafeta Street these points should be borne in mind and it is especially important to remember to be careful of loose bulls coming from behind even when you think that all the bulls have already passed by. Just in front of the Telephone Exchange (Telefónica) this is a short stretch of about 90 metres (about a 100 yards) which opens out at the end of Estafeta Street and leads to the corral at the entrance to the bull ring. The danger is increased by the presence of inexpert runners and by the change in the pace of the bulls. This stretch turns progressively towards the left until it goes straight down into the final stretch leading into the bull ring. Here the bulls quicken up but the runners in front generally don’t have time to do it with the same rapidness. This creates dangerous situations and the statistics reveal a high level of incidents on this stretch of the run. On this stretch the width is only three meters wide and through this “corridor” all the runners must pass as well as the pack of bulls. It is easy for the bulls to create space for themselves of course. But the difficulty for the runners resides in the fact that the route changes suddenly on entering the entrance to the bull ring and there is a steep slope to reach ground level. It is not easy to keep one’s balance at times. If a runner falls, there are some gaps in the wall through which the runner could crawl to safety. It is important not to create a pile up here of fallen runners as the space is so tight. 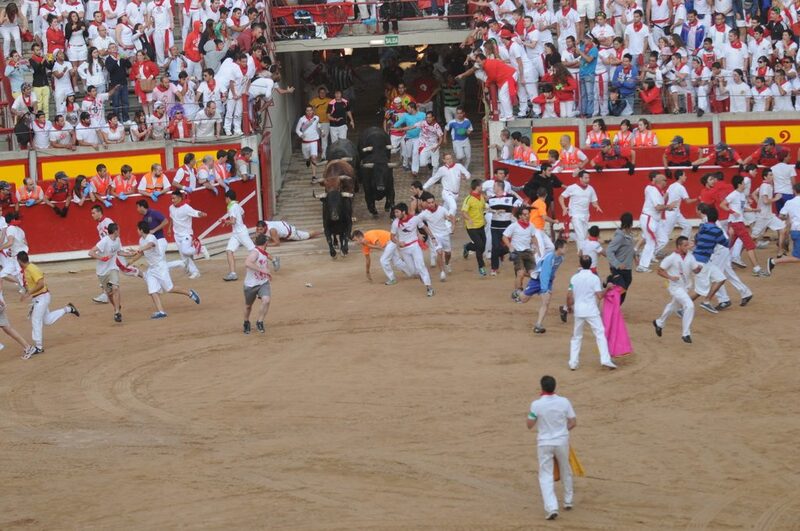 It is also advisable not to run in to the bullring after the bulls have entered. It is not infrequent for a bull to turn back and the problem is that the entrance gate is immediately shut when the last of the bulls enters for the security of those outside the bullring. Once the last bull goes through the gates begin to close so it would be safer to pull up your run for your own safety and the safety of others who might get crushed by too many runners coming behind. The runners should immediately head for the sidelines to allow the waiting drovers to lead the bulls to the bullpen on the far side of the ring. Running into the centre of the ring is dangerous as you are in the path of the bulls heading towards their pens. The arena of the bullring is filled with sand taken from the beach. This is the classic soil for bullfighting. If you don’t wear sneakers or sports shoes of some kind, the sand could cause falls and maybe put the runner at the mercy of the animals. Consequently, it is important to take note of the change of the ground, from the flagstone of the street to the sand inside the bullring. It is also important to realize that entering the ring in front of the bulls it is necessary to turn either right or left. The bulls do not normally make a brisk turn on entering the ring -their instinct is to run straight ahead. A quick turn to the left or the right should bring you away from the danger of the bulls coming behind. It is very important to allow the dobladores (guides who lead the bulls towards the pens) to do their work. These men wear a green shirt and have a cape in their hands. They shouldn’t show the cape to the bull as is done during bullfights. Rather, they drag the cape on the ground and lead the bull in this way towards the pens. They must be left alone to do their job without being distracted. There is also a custom among the runners themselves to give a beating to anyone who interferes with the bull while inside the ring or who hampers the work of the dobladores. A bad custom perhaps, but it does exist. So, as well as a fine you might also get a beating.